Thomas Baldwin Marsh (November 1, 1799-January 1866) was an original member of the Quorum of Twelve Apostles. He served as president of the Quorum of the Twelve Apostles from 1835-1839. He was excommunicated from the church March 17, 1839, and remained disaffected for much of his life. Marsh rejoined the church in July 16 1857, but never again served in church leadership positions. Marsh was born in the town of Acton, Massachusetts in Middlesex County, Massachusetts on November 1, 1799. His father was James Marsh. His mother was Mary Law. He spent his early life farming in Westmoreland, New Hampshire. As a young man, Marsh developed a pattern of traveling and working for various employers. Marsh ran away at age fourteen to Chester, Vermont, and worked as a farmer for three months. Then he left for Albany, New York, working as a waiter for eighteen months. He spent two years working at the New York City Hotel in New York City, New York, then returned to Albany for a year, and then went back to the hotel for two more years. He spent eighteen months working as a groom for Edward Griswold in Long Island, New York. At age twenty-one, he married Elizabeth Godkin on November 1, 1820, while employed for Griswold. After his marriage, he attempted unsuccessfully to run a grocery business for eighteen months. After that, he spent seven years working at a type foundry in Boston, Massachusetts. During his work at the type foundry, he joined the Methodist Church. However, dissatisfied because Methodism did not correspond to the Bible in his mind, he left and joined a group of friends in what others called a Quietist sect. Marsh left his home in Boston and journeyed west, traveling with a Benjamin Hall. In his words, "I believed the Spirit of God dictated me to make a journey west." He stayed at Lima,in Livingston County, New York, for three months before returning home. On the way home, he stopped at Lyonstown, where a woman informed him of the Golden Plates which Joseph Smith had obtained. She directed him to Palmyra, New York, and told him to seek out Martin Harris. Marsh traveled to Palmyra and discovered Martin Harris at the printing office, working on the printing of the Book of Mormon. He was able to obtain the first sixteen pages as a printer's proof. He met Oliver Cowdery at this time as well. Returning to his home, he showed the sixteen pages to his wife. They both were pleased and corresponded with Oliver Cowdery and Joseph Smith. After the church was organized on April 6, 1830, he moved with his family to Palmyra to join them that September. Shortly after his arrival, Marsh was baptized by David Whitmer in Cayuga Lake, and a few months later ordained an elder by Oliver Cowdery. From September 26 to September 28, 1830, Joseph Smith received Doctrine and Covenants section 31 directed to Marsh. In this section, he was called as the church physician. Marsh moved with the Church to Kirtland, Ohio, in the spring of 1831. He was ordained a high priest and received a call to proselyte to Missouri with Ezra Thayer (See Doctrine and Covenants 52:22). Thayer delayed for a long time, and so Marsh went to Joseph Smith, who appointed Selah J. Griffin in Thayer's stead. (See Doctrine and Covenants 56:5). May 4th, 1835, in company with the Twelve I left Kirtland and preached through the eastern states, holding conferences, regulating and organizing the churches, and returned September 25. After these activities with the Twelve Apostles, Marsh returned to Fishing River, Clay County, Missouri, in April 1836. Severe difficulties between Mormons and the larger community continued to plague the LDS people in Missouri. Marsh was chosen as a delegate from his community to try to resolve these issues. Despite the efforts of Church members, their Missouri neighbors decided that the Saints must leave Clay County. In September of 1836, he returned to Missouri and joined the Saints in their new location, a city called Far West in Caldwell County, Missouri. The town had been founded by the presidency of the Missouri Stake, consisting of David Whitmer, William W. Phelps and John Whitmer. These men were authorized to purchase land on behalf of the Church for the benefit of Latter Day Saint settlement. Meanwhile, in Kirtland, the financial situation of many of the Mormons unravelled with the failure of the Kirtland Safety Society bank. A dispute arose between the presidency in Missouri and the Church presidency in Kirtland over the land funds, with both sides accusing the other of financial improprieties. Marsh sided with the church presidency and convened a series of church courts in the spring of 1838. He charged the Whitmers and Phelps along with Oliver Cowdery of financial impropriety and other failings. The court released these men from their positions and disfellowshipped them. Marsh was named as President of the church in Missouri, with David W. Patten, and Brigham Young, as Assistant Presidents, on April 6, 1838. In April of 1838, Church presidents Joseph Smith and Sidney Rigdon moved to Far West, which became the new Church headquarters. Although disfellowshipped, David and John Whitmer, Oliver Cowdery, W.W. Phelps and other former leaders (who were known as the "dissenters") continued to live in the County. By early June, some of the more zealous Mormons, led by Sampson Avard, formed a society which came to be known as the "Danites." According to Marsh, these men swore oaths "support the heads of the church in all things that they say or do, whether right or wrong" (Document, p. 57). According to Reed Peck, two of these Danites, Jared Carter and Dimick B. Huntington, proposed at a meeting that the society should kill the dissenters. Marsh and fellow moderate, John Corrill, spoke vigorously against the motion (Peck, pp. 22-23). 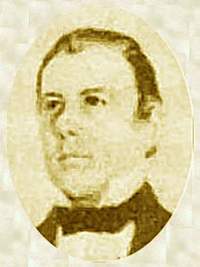 On the following Sunday, however, Sidney Rigdon issued his "Salt Sermon" in which he likened the dissenters to salt that had lost its savor and was "good for nothing, but to be cast out, and to be trodden under foot of men" (Van Wagoner, p. 218). Within a week the dissenters had fled the county. "A company of about eighty of the Mormons, commanded by a man fictitiously named Captain Fearnot [David W. Patten], marched to Gallatin. They returned and said they had run off from Gallatin twenty or thirty men and had taken Gallatin, had taken one prisoner and another had joined the company. I afterwards learned from the Mormons that they had burned Gallatin, and that it was done by the aforesaid company that marched there. The Mormons informed me that they had hauled away all the goods from the store in Gallatin, and deposited them at the Bishop's storehouses at Adam-on-diahmon" (Document, p. 57). Because a Mormon attack was believed imminent, a unit of the state militia from Ray County was dispatched to patrol the border between Ray and Mormon Caldwell County to the north. On October 25, 1838, reports reached Mormons in Far West that this state militia unit was a "mob" and had kidnapped several Mormons. The Mormons formed an armed rescue party and attacked the militia in what became known as the Battle of Crooked River. Although only one Missourian was killed, initial reports held that half the unit had been wiped out. This attack on the state militia, coupled with the earlier expulsion of non-Mormons from Daviess County led Missouri's governor to respond with force. On the 27th of October he called out 2,500 state militia to put down what he perceived as a Mormon rebellion and signed what became known as the "Extermination Order" (Baugh, pp. 108–09). "About this time I got a beam in my eye and thought I could discover a mote in Joseph's eye, though it was nothing but a beam in my eye; I was so completely darkened that I did not think on the Savior's injunction: 'Thou hypocrite, why beholdest thou the mote which is in thy brother's eye, when a beam is in thine own eye; first cast out the beam out of thine own eye, then thou shalt see clearly to get the mote out of thy brother's eye.'" Years later, in 1864, George A. Smith claimed in a sermon that Marsh had left the Church because of a dispute between his wife and other Mormon women over a milk cow (Journal of Discourses, 11:9). Although this tale (see Ludlow, Doctrine and Covenants, p. 363) has made its way into Mormon folklore, Smith's statements are not supported by any contemporary evidence. In 1857, Thomas Marsh was rebaptized. Marsh wrote an autobiography in 1864, recounting his church service and rebellion. It was published in the Millennial Star of that year. However, his religious affiliation still may not have been fixed. According to Elder Thomas Job, a missionary of the Reorganized Church of Jesus Christ of Latter-day Saints (now known as the Community of Christ) serving in Utah, shortly before his death Marsh attended an RLDS conference in Salt Lake City, and there claimed that Young Joseph (Joseph Smith III) was a prophet and bore a strong testimony to the truth and necessity of the Reorganization. He said that he would move east to join them if Young Joseph would send for him. Thomas B. Marsh died in Ogden, Utah, in January of 1866. He is buried at the Ogden Cemetery. The grave is adorned with a plank of wood, on which can barely be read "T. B. M.". Despite his prominence in early church history, Marsh is rarely mentioned in instructional classes, discourses on religion or sermons in the modern church. Marsh's conversion story is occasionally cited as an example of how powerful the Book of Mormon can be in convincing people of the truthfulness of the church. When his apostasy is mentioned, he is often referred to either as an example of pride or as an example of one who failed to fulfill his calling to serve the church. Mormons note that, had Marsh been faithful, he may have eventually become president of the church instead of Brigham Young, who was the original third apostle. Baugh, Alexander L. , A Call to Arms: The 1838 Mormon Defense of Northern Missouri, BYU Studies, 2000. This page was last edited on 29 December 2011, at 02:13.